I his boldly colored manakin lives in both rain forest anil the '/"¡'i" ' secondary woodland that grows after rain forest clearance. 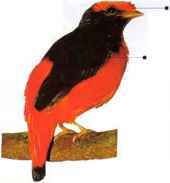 It is seen in the middle levels of the forest, feeding mainly on berries, which it plucks in hovering flight, and sometimes taking small insects. 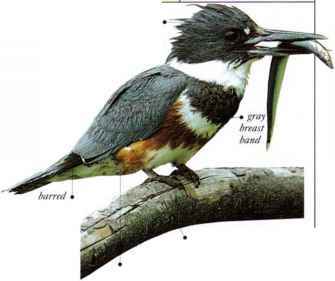 • NliST A shallow cup nest attached to a horizontal fork in a tree. • Distribution FromS.ii. Mexico to W. Colombia and \Y. Ecuador. Mainly inhabiting the lower growth of rain forest, this cotinga also ascends to forage in the upper branches for large insects or fruits. The brightly colored males gather in noisy, spectacular, communal displays at special sites known as "Icks." but otherwise the species is generally shy and inconspicuous. • Distribution Drier lowland rain forests from s. Colombia, s.w. Venezuela, south to n.k. Peru and w. Brazil. FliMAI.I!